People and or passenger in the express boat. This cruise ship in the Chao Phraya River. Ro-Ro/Passenger ship. New ferry to Pemba or Dar es Salaam loading, ready to depart. Stone Town, Zanzibar City, Unguja, Tanzania. BANGKOK, THAILAND - MAY 1, 2018: Many people go to work or travel by boat. 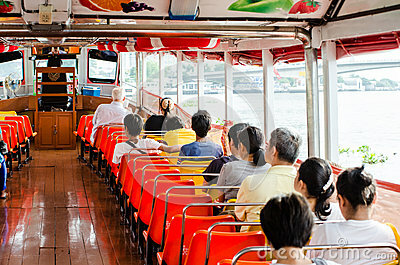 The boat is one of public transportation in Thailand. A passenger ferry in Gothenburg in the winter.